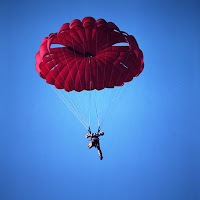 TyasJetra Self Improvement Blog: Who Packed Your Parachute ? Who Packed Your Parachute ? Charles Plumb was a US Navy jet pilot in Vietnam. After 75 combat missions, his plane was destroyed by a surface-to-air missile. skydiverPlumb ejected and parachuted into enemy hands. He was captured and spent 6 years in a communist Vietnamese prison. He survived the ordeal and now lectures on lessons learned from that experience! "I packed your parachute," the man replied. Plumb gasped in surprise and gratitude. The man pumped his hand and said, "I guess it worked!" Plumb assured him, "It sure did. If your chute hadn't worked, I wouldn't be here today." Plumb couldn't sleep that night, thinking about that man. Plumb says, "I kept wondering what he had looked like in a Navy uniform: a white hat; a bib in the back; and bell-bottom trousers. I wonder how many times I might have seen him and not even said 'Good morning, how are you?' or anything because, you see, I was a fighter pilot and he was just a sailor." Plumb thought of the many hours the sailor had spent at a long wooden table in the bowels of the ship, carefully weaving the shrouds and folding the silks of each chute, holding in his hands each time the fate of someone he didn't know. Now, Plumb asks his audience, "Who's packing your parachute?" Everyone has someone who provides what they need to make it through the day. He also points out that he needed many kinds of parachutes when his plane was shot down over enemy territory - he needed his physical parachute, his mental parachute, his emotional parachute, and his spiritual parachute. He called on all these supports before reaching safety. Ini blognya Tyas yang lain kah? Maaf yaa kalau salah. wah tumben hadir blog yang ini mbak, btw shout boxnya mana??? Hi! You have nice content here. Care to exchange links? Kindly add my blog then let me know so I can add you aswell. My name is Matt and I am partial owner of e-ceramica network. We are a very strong company selling ceramics and similar products. I will get straight to the point. First of all, sory to write to you like this, I could not find the contact form on your site. Our company would like to connect with sites like yours using links. Would you maybe be interested in link exchange with our site: www.e-ceramica.com? Our site gets visited by few hundred of our partners each day and not to mention people who buy in our online ceramica shop . So I belive we would both benefit out of link exchange alot. If you are interested in link exchange, please send me an e-mail on admin@sayeconomy.com . Thank you for your time and keep up with good work, I liked it alot! Hi,thank you for the visit.Greetings.